Gentlemen - if you please, a small request for some guidance....? later - picture by Christian Rogge, used without permission. Now that I have a pile of new siege equipment, and am therefore running out of excuses, I hope to make rather better progress with my proposed French Napoleonic siege train. My scale requirements are what I like to think of as 20mm, but in fact they are really old-fashioned "true 25mm" - i.e. men about 21-22mm to the eye - which is, as near as you like, 1/72 scale in scientific money. No-one makes anything like a proper French siege gun in this scale, as far as I know, so I have been doing a little poking around. I fancied the idea of an overscale 12pdr cannon mounted on my size of wheels - I have purchased a test casting of a cannon which is actually made in 28mm scale, but it would pass for a Napoleonic 24pdr if I could get some better sized wheels. Most of the French siege guns in the Peninsula, for example, were pre-Gribeauval - old Vallière pattern guns. My test casting would pass for one of these, but it came with 30mm, 12-spoke wheels - far too big, man. According to the information I have to hand, the diameter of the wheels on the French 24pdr should be either 58" or 60", and the discrepancy may be due to the confusion caused by the pesky "Paris foot" measurement used by the French - 1 Paris foot is/was equal to 325mm. I reckon that at 1/72 scale I am looking for wheels of 22 or 23mm diameter, 12-spoke, pretty chunky build. Thoughts of Lamming come to mind, but I'm not sure of the size of Lamming wheels. I still have some more research to do, obviously - does anyone know of a firm who sell suitable artillery wheels in white metal? 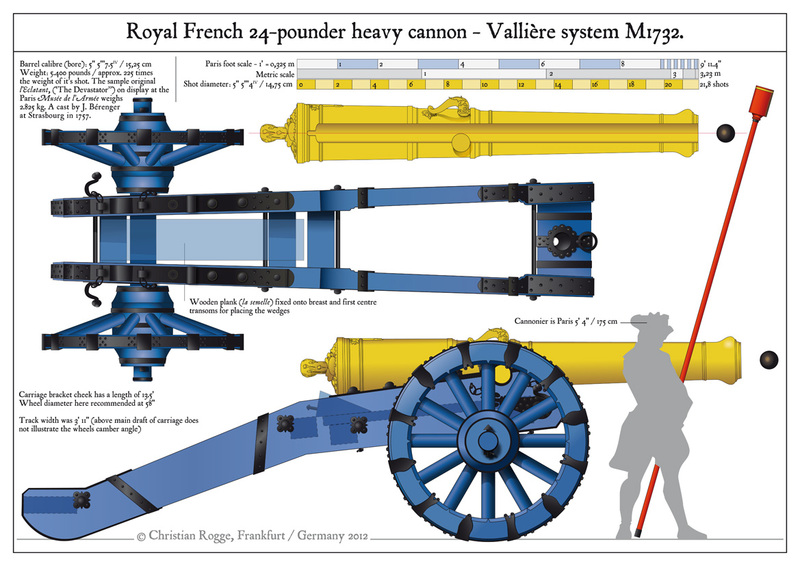 If I could get my hands on an odd wheel of the right size (out of copyright, of course), I could probably commission a small supply for my French siege guns. It does seem to me, though, that a wheel casting is an obvious spare part for someone, somewhere to have in production as a stock item. Haven't found anyone yet, but I'd be delighted to get some ideas. How about Irregular? I bought some spare wheels from them a few years ago, for making baggage wagons, and they were really helpful. I'm sure they do different sizes too. I can measure the ones I got when I get home from work, to see if they fit the bill. Yes, they're the right size and quite chunky. 25mm French 8 pdr wheels. If memory serves (it was a few years ago) I bought 20 or 24 very reasonably. I notice they brand as 28mm now, not 25, but I'm not sure they've changed size! Minifigs do a siege gun in their 25mm range (which is at least true 25mm!) code MALA3 at the bottom of this page... might be worth a punt? Thanks for suggestions - Steve - particularly good shout - I've ordered up one of the MF guns - it seems the MALA3 Marlburian gun is one and the same as the ECW siege gun, but I've seen a pic of that one, and it looks OK.